A huge thanks to our friends at Walmart for sponsoring todays post. This post contains affiliate links. 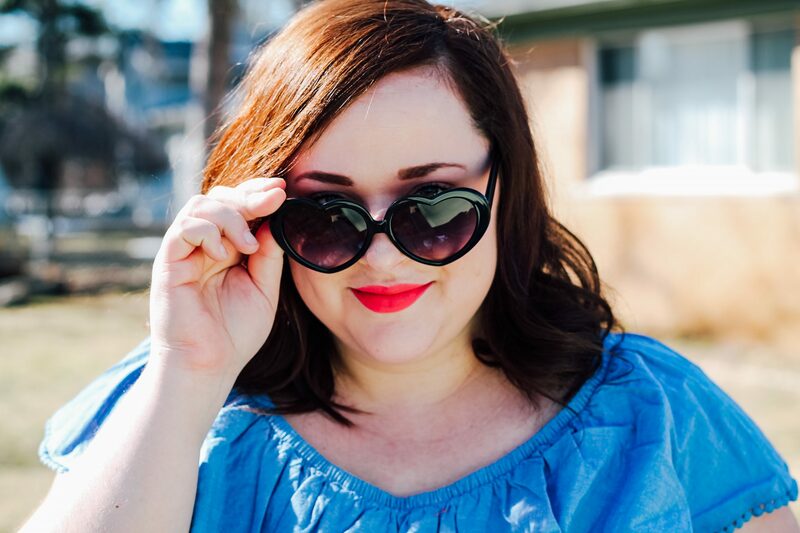 Keep scrolling to see some Plus Size Spring Style on a Budget! Hope you’re having a great day so far! 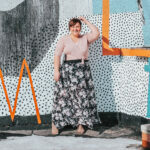 I am so excited to share todays post with you! As a busy momma with two boys, three dogs, three cats, and a hubby – everything is budgeted. 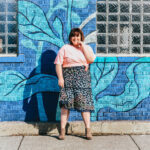 My closet is full of pieces that can be styled more than one way, worn more than one season, and pieces that are both comfortable AND affordable. 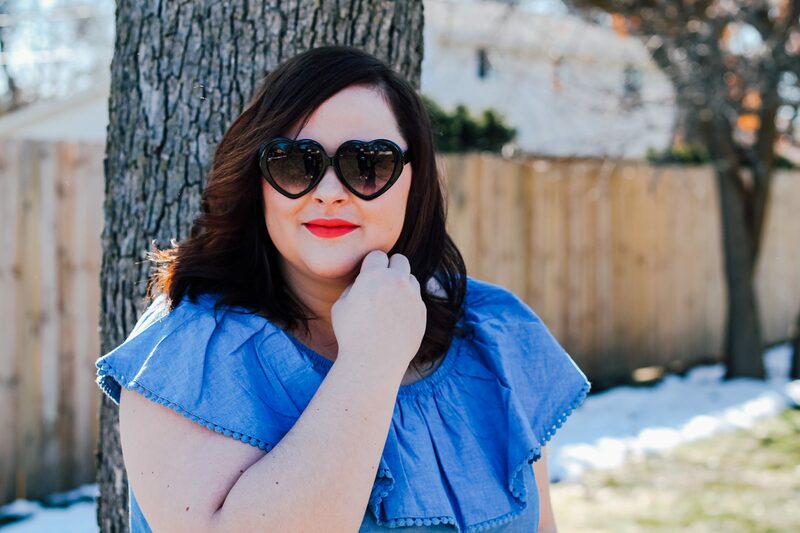 I love myself a good deal, so when it comes to Spring Style, you better believe it’s budget-friendly! 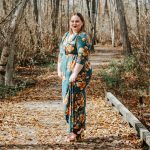 I wanted to challenge myself to put together a whole look, head-to-toe, of affordable pieces from Walmart. I shopped online from the comfort of home and chose items with 2-day shipping – absolutely love that Walmart offers thousands of items that can be to your door in a flash! I really couldn’t be more pleased with how the outfit came together, ready to see? 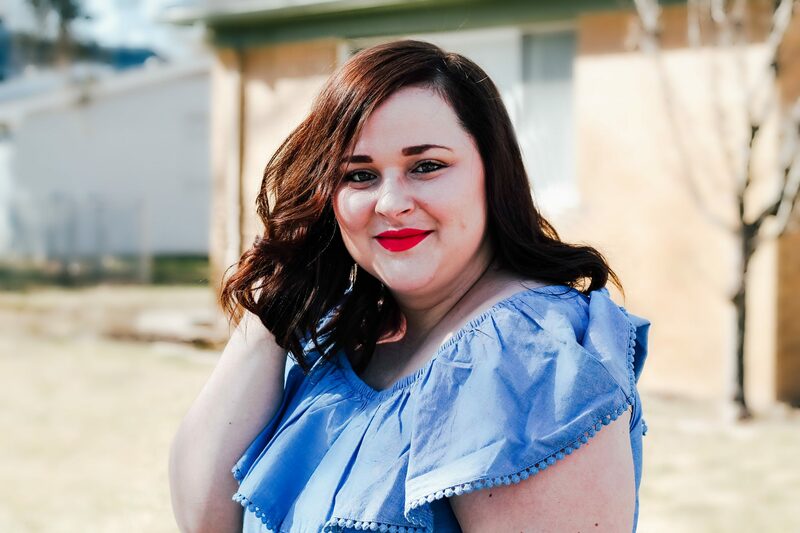 I’ve really been loving blues lately, which is why I gravitated towards this adorable Faded Glory Women’s Plus Ruffle Peasant Shirt. I just adore the pom-pom trim, ruffle sleeves, and that it comes in a variety of colors. This is such an easy and flattering top that can be styled so many different ways! 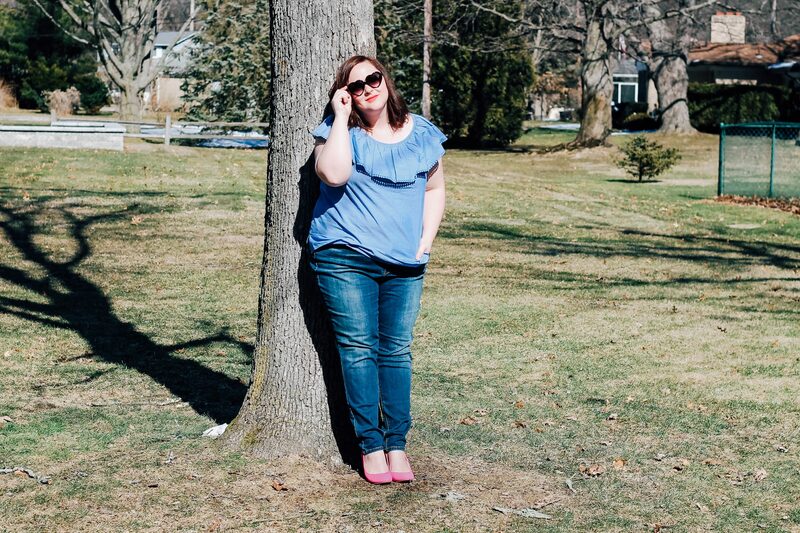 The jeans are Bandolino Women’s Plus Millennial Curvy Jeans and they come in two different washes, I’m wearing them in “Alameda” and it’s the perfect everyday color. 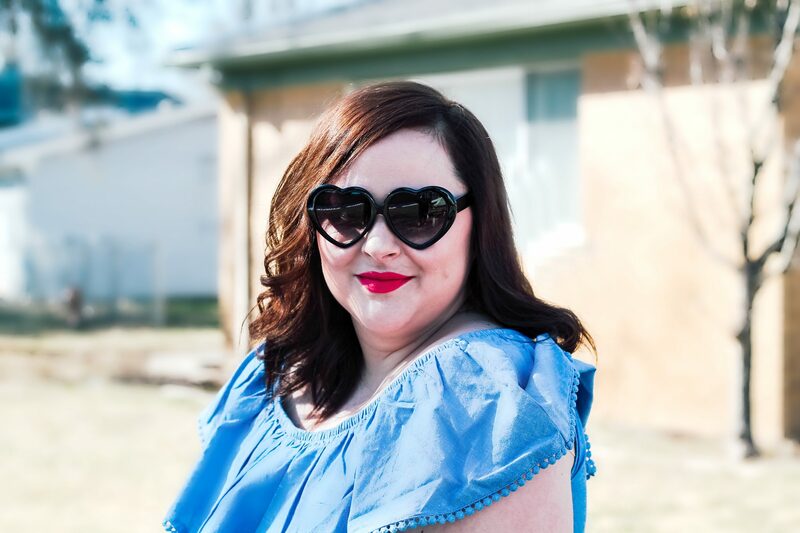 But wait, can we talk about these Large Oversized Womens Heart Shaped Sunglasses for a minute? They’re under $10 and easily the cutest pair of sunglasses I’ve ever worn. 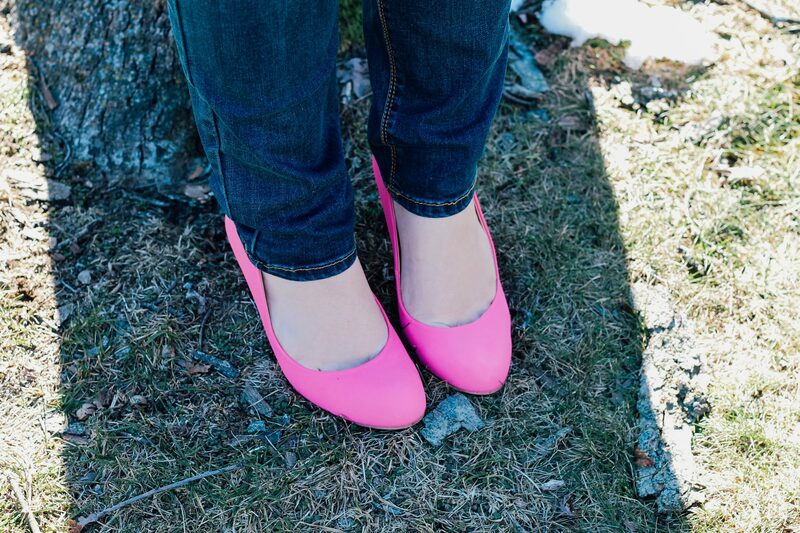 And these Brinley Co. Women’s Chunky Heel Matte Finish Pumps in pink were just so fun to style, and were the perfect addition to this fun outfit. 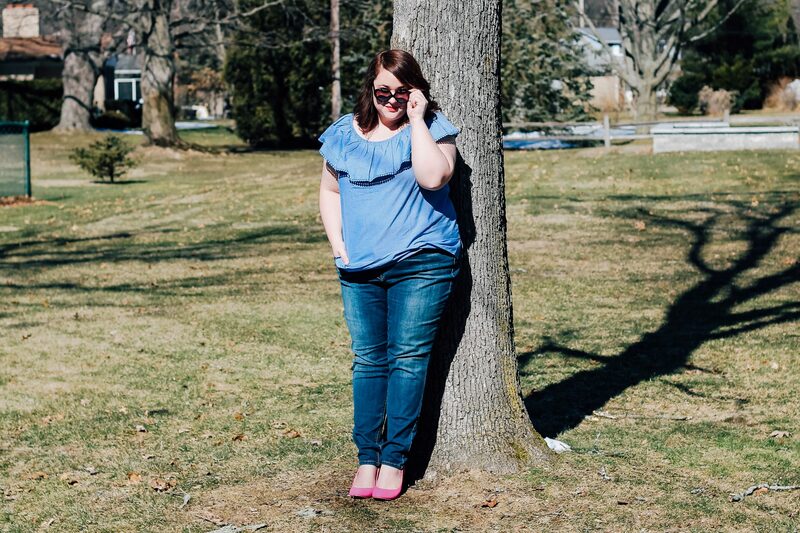 I chose the sunglasses and the pink pumps to up the fun factor of this outfit, I felt that with a blue top and denim, I needed something to really make it pop! This outfit makes me feel feminine and flirty and my kiddos approved of the heart glasses and pink pumps! I can’t wait to mix and match all of these pieces throughout Spring and Summer! 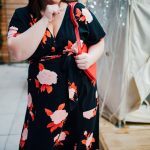 I’ve included a few other styling ideas below, just in case you decide to try one of these stylishly affordable pieces from Walmart, too! Pair the Faded Glory Women’s Plus Ruffle Peasant Shirt with a pair of black skinny jeans, tucked into a high-waisted skirt, or wear it belted! 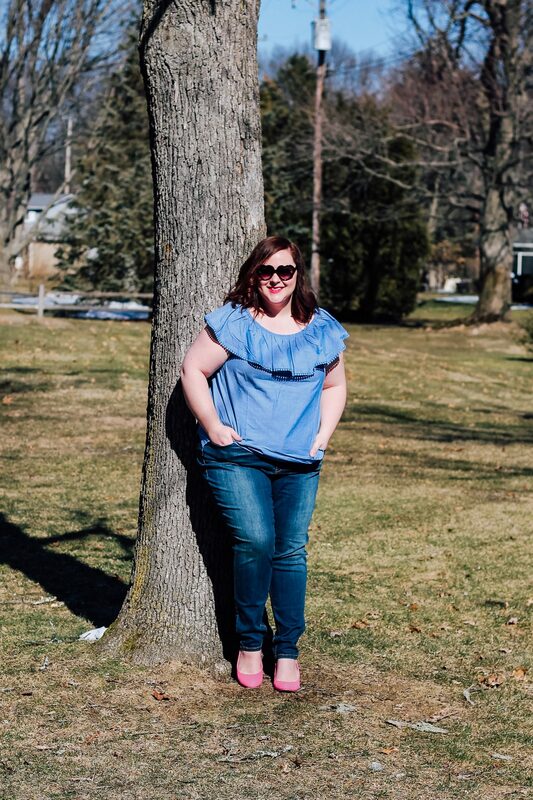 Try the Bandolino Women’s Plus Millennial Curvy Jeans paired with a tailored blazer, off-the-shoulder top for a date night, or with a cardigan and flats. The Brinley Co. Women’s Chunky Heel Matte Finish Pumps are such a fun statement piece! Try them with a fun Spring dress, pantsuit, and with a pair of black skinny jeans to really make them pop against the contrast. So what are you waiting for? Shop the post below and pick out an item or two that you’d like to try! I can’t wait to see how you style them – if you share on social media be sure to tag me so I can see!